Yesterday evening Jonathan and I ventured over to the public library to pick up a book I had put away for me. It was the first time for him to enter into the building so I was thrilled to have him come along with me. We didn't look around but we did end up stopping at the movie section and much to my delight discovered a couple DVDs of the British version of The Office! I LOVE The Office and though I've only seen a few episodes of the British version I'm looking forward to watching them. It's pretty much exactly the same as the States but their jokes are portrayed in an insanely dry way which is awesome! So we snagged them all. We've got seven days to watch them so I'm foreseeing a few nights as an Office marathon! Anyways the book I had put aside for me is called "Love and Louis XIV: The Women in the Life of the Sun King" by Antonia Fraser. Now perhaps it's unknown to the general public that I love history. So much so that it probably annoys the people I'm around when I feel I HAVE to spurt out random facts about historical events during a movie or any moment in the day. It's like I feel that people would appreciate the story or even the world a whole lot more if they only understood where such and such a thought or event came about. Or how this person is related to that person and why it's important to know about such and such relationship with so and so. I'm sure people are not to keen to hear me go off...but sometimes I can't help it. 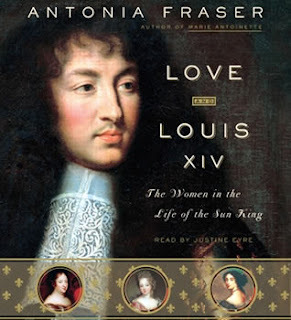 Anyways this summer my obsession has been with the French monarchy from the 17th to 18th Century. Off the bat people instantly assume I'm talking about Marie Antoinette but though her life is interesting I'm falling more and more in love with the people before her and around her who really set the tone for the French Revolution. I have to stop myself before I start going off maybe even give a lecture about this time in history because that's really not the point of the blog post. Really what I planned to type about was regarding yesterday evening. Jonathan went to bed earlier than his usual time and I planned on joining him but after brushing my teeth, washing fact etc... I couldn't resist just reading a few pages of my new book. 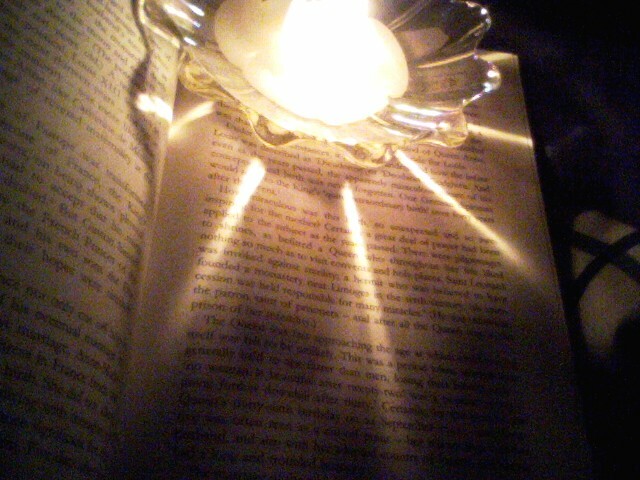 So I slipped quietly into bed, lit a candle and huddled up like a child who should be sleeping but secretly is reading. I placed the candle on the book and the reflection of the glass holder flickered all over book. I loved every moment of my reading by a candle light experience. I felt daring and like I would get caught and asked to blow out my candle so every minute seemed precious. Yet Jonathan was fast asleep and only my imagination was making the secret reading so....secretive. And so though it may have been silly of me I still simply adored last night! i had no idea you were so passionate about history. i think it's awesome and would like to know more about it myself. i love knowing about people's personal lives in history, biographies and such. i think it's the factual side of history that's boring. and that photo is sooo cool! it hought you'd stolen it online or something. oh teaka, i'm sad we didn't hang out more when i was still in canada. it seems like we have so much in common.